Tripoli Film Festival 2018 will pay tribute to the famous Lebanese Filmmaker, Late Randa Chahal. A "Retrospective" of her works will be showcased during our 5th edition. وسيصار الى عرض مجموعة من أعمالها السينمائية خلال الدورة الخامسة للمهرجان. 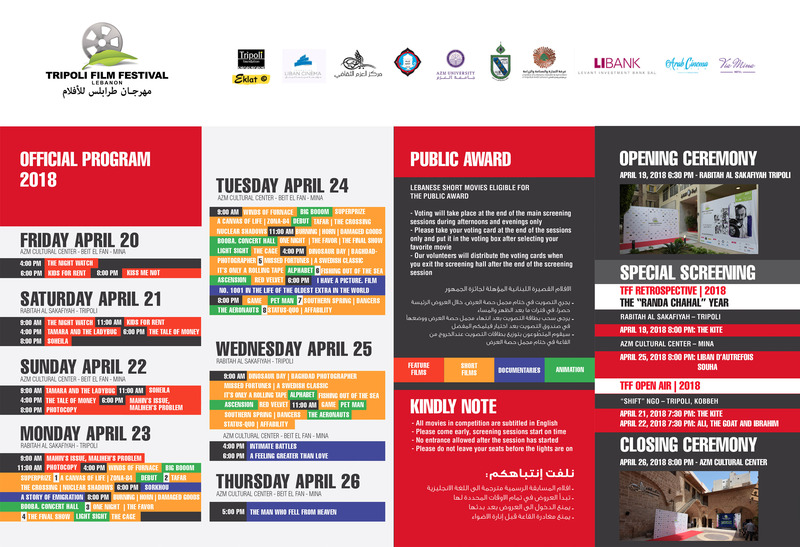 Each year, Tripoli Film Festival implements a Theme Day during the Festival period in Tripoli, where 2 to 4 documentaries are showcased with panel discussions after each screening. For this year we have chosen “Resilience & Reconciliation – Lessons from Tripoli” as a Theme for our Out of Competition Day that is expected to occur on April 25th, 2018 in Rabita Sakafiyah - Tripoli. Tripoli has long suffered from instability due to the ongoing clashes between Jabal Mohsen and Tebbeneh. This instability peaked between 2008 and 2014. During this period of unease, the civil society in Tripoli was keen on retaining the city’s energy. The significance of these efforts was displayed in 2013 during the peak of the clashes and specifically after the bombing of two mosques “Salam and Takwa”... Still after 2014 the civil society continued its main aim which was to establish conflict resolution and reconciliation between the different opposing parties in Tripoli. The Theme Day will shed a light on some of the initiatives done by the civil society in Tripoli during that period and offer a platform for the audience to discuss and elaborate the success of reaching their goal. For the movies we will choose from the documentaries produced locally by 2 initiatives that were working on the field in Tripoli for the last 5 years and still: “Coalition Of campaign Against Violence” and “Roadmap to Reconciliation in Tripoli”, some of these documentaries were supported by USAID – OTI others were supported by UNDP. Ghasan Salhab is a Lebanese Director born in Dakar. In addition to making his own films, Ghassan Salhab collaborates in writing various scenarios and teaches filmmaking in Lebanon. He has directed six feature films; all were selected at international festivals or exhibitions. In 2016, he was a “guest-resident” at DAAD (Berlin). غسان سلهب ، مخرج لبناني من مواليد داكار. بالإضافة إلى اخراج أفلامه الخاصة به ، يتعاون غسان سلهب في كتابة سيناريوهات متعددة ويدرس الإخراج السينمائي في لبنان. قام بإخراج ستة أفلام روائية طويلة، تم اختيارها جميعها في مهرجانات أو معارض دولية. في عام 2016 ، حلّ "ضيفًا مقيمًا" في الهيئة الألمانية للتبادل العلمي (DAAD برلين) وفي عام 2010 ، تم تكريم افلامه في المهرجان الدولي لاروشيل (فرنسا) و ايام قرطاج السينمائية في تونس ، وفي عام 2018 ، في سينيماتيك كيبيك. نشر غسان سلهب مقالاته في العديد من المجلات. Betty Taoutel Sfeir is a writer, theater director and actress on theaters as well as on television and cinema screens who turned her passion into her job. She has a bachelor degree in Theater, Audiovisual and Cinematographic Studies, a Master’s degree in Dramaturgy and a Diploma in advanced studies in Theater. She is a lecturer in different universities in Lebanon. She was jury a member in Star Academy (Arabia) and directed many successful plays at the national and international levels. Betty Taoutel also acted in about fifteen television series, thirty short films and several feature films. بيتي توتل صفير كاتبة ومخرجة وممثلة على خشبة المسارح كما على شاشات التلفزيون والسينما. حولت بيتي شغفها إلى عملها وهي حاصلة على درجة البكالوريوس في العلوم المسرحية والسمعية-المرئية و السينمائية ودرجة الماجستير في الدراماتورجيا ودبلوم دراسات معمقة في المسرح وهي محاضرة في جامعات مختلفة في لبنان. كانت عضوًا في لجنة التحكيم في ستار أكاديمي (العربي) كما قامت بإخراج العديد من المسرحيات الناجحة على المستويين الوطني والدولي. مثلت بيتي توتل أيضاً في حوالي خمسة عشر مسلسل تلفزيوني وثلاثين فيلم قصير والعديد من الأفلام الروائية الطويلة. Jana Wolff studied Communication in Social and Economic Contexts (M.A.) at the Berlin University of the Arts. Since the late 90s she has been working for Berlinale/EFM and has also had various positions in other national and international film festivals. She was Head of PR & Festival Distribution at the German Film and Television Academy (dffb), Head of Acquisition & Sales at Pluto Film Distribution Network and now she is in charge of Marketing & Advertising at the European Film Market. حازت جانا وولف على ماجيستير في الاتصالات في السياقات الاجتماعية والاقتصادية من جامعة برلين للفنون وتعمل منذ أواخر التسعينات في مهرجان برلين السينمائي الدولي ، كما شغلت العديد من المناصب في المهرجانات السينمائية الوطنية والدولية الأخرى. ترأست قسم العلاقات العامة وتوزيع المهرجانات في أكاديمية الفيلم والتلفزيون الألمانية في برلين، و قسم الاستحواذ والمبيعات في شبكة توزيع الأفلام "بلوتو" ، وهي الآن مسؤولة عن التسويق والإعلان في سوق الأفلام الأوروبية. Rosy Raggi is a Lebanese Television Director and Producer. She studied French literature, audiovisual and education. In 1989, she worked as director for TV and in 2001 she became an executive producer leading the production of various shows through major Pan Arab channels including MBC, Rotana, and Orbit. In 1992 she started teaching film directing at ALBA-UOBin Lebanon where she created in 2015 the Television Department. روزي رجي مخرجة ومنتجة لبنانية. درست الادب الفرنسي والاخراج والتعليم وعملت في عام 1989 كمخرجة للتلفزيون وفي عام 2001 كمنتجة منفذة لبرامج عديدة لقنوات عربية مثل mbc , orbit , .Rotana وفي سنة ١٩٩٢ بدأت بتعليم الإخراج في جامعات لبنانية مختلفة مثل جامعة البلمند في لبنان حيث أنشأت قسم التلفزيون في سنة ٢٠١٥. Born in Cairo in 1978, Sherif El Bendary graduated from the faculty of Applied Arts in 2011. He studied filmmaking at the Egyptian Higher Institute of Cinema in 2002. He graduated in 2007, and was appointed as a lecturer in the Filmmaking department in 2008. His movies and short films have been screened in multiple international and local film festivals. For his extraordinary efforts, he was selected to be a jury member at numerous local and international festivals. ولد المخرج شريف البنداري في عام 1978 وتخرج من كلية الفنون التطبيقية في عام 2001. درس الإخراج السينمائي في المعهد العالي للسينما في القاهرة سنة 2002 وتخرج في عام 2007 ، و قام بتدريس الإخراج السينمائي سنة 2008 في المعهد العالي للسينما. تم عرض أفلامه في العديد من المهرجانات السينمائية الدولية والمحلية وبفضل جهوده، تم اختياره ليكون عضوا في لجنة التحكيم في العديد من المهرجانات المحلية والدولية.